Produced by Rodney Jones, Jr. (credits include Chris Brown, Mary J. Blige, Mary Mary) “Breakin' Thru” highlights Eric's signature, innovative, and energetic Jazz/R&B sound that uniquely crosses over all music boundaries & will undoubtedly get you moving! Every now and then an artist bursts onto the scene, changing the rules and challenging the status quo. Eric Darius is one of those artists fearlessly pushing all musical boundaries. He is one of the most exciting musicians to enter the Contemporary Jazz scene in the last decade. His explosive arrival as a recording artist at the age of 17 caused a frenzy worldwide! Now, with six critically acclaimed albums under his belt, several Number One hit singles, Seven Top 10 radio hits on Nielsen’s R&R/Billboard Contemporary Jazz Charts, and a SESAC Top 10 Jazz Artist of the Year award, international recording artist, Eric Darius is on the verge of superstardom. Prophetically hailed Debut Artist of the Year by Smooth Jazz News in 2004, Eric has shared the stage with innumerable world renown, Grammy Award winning artists, such as Prince, Jamie Foxx, Mary J. Blige, David Foster, Carlos Santana, Babyface, & George Benson, just to name a few. His music innovatively crosses over all music boundaries from Jazz, R&B, Hip-Hop, to Pop, creating a very distinctive, fresh sound and approach that is uniquely his own. His dynamic, energetic live performances have become a staple globally in the Contemporary Jazz format. Whether he’s being featured on FOX’s hit TV show, The X Factor, or TNT’s hit drama series, Mob City, Eric’s presence is definitely being felt in the entertainment world. He continues to be an artist who knows no boundaries, forges new paths, bridges generational gaps, and makes music with infinite possibilities. With the release of his new hit single, "Breakin' Thru" on his own independent label, SagiDarius Music, Eric is becoming a force that is unequalled in today’s musical landscape. 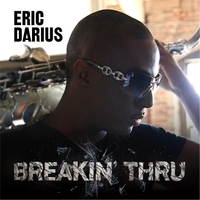 One of the most exciting recording artists and live performers that has ever crossed the threshold of Smooth Jazz, saxophonist Eric Darius breaks new ground by starting his own label (SagiDarius Music) for the release of his upcoming album BREAKIN’ THRU. The recently released first single, the Top 10, title track, “Breakin’ Thru,” featured his trademark high energy funk from start to finish, whereas his new single, “Dare 2 Dream” is more of an anthem that builds steadily using contemporary production influences that will motivate you to be your best self. Simmering and soaring sax are held down with hypnotic beats, and a killer melody and groove. The song promises to capture your imagination like dreams often do – taking hold and not letting go. Turn it up, and “Dare 2 Dream”!